Keep up-to-date and ask questions about the upcoming Moodle Moot! Whither higher education after MOOCs? The advent of MOOC means another success of technology in higher education more in the sense of the Internet than "educational technology." The Internet has helped the global online learning in higher education shift from the mere provision of electronic platforms for learning to the thorough digitization of learning environment including production, delivery, acquisition, understanding and use of knowledge. The thoroughness of the digitization, however, entails a reconsideration of the place of higher education in society, whose tentative conclusion in this talk is the "unbundling" of the functionalities provided so far by higher education institutions, namely the conceptual and actual independence of campus, faculty, student body, staff, classrooms and libraries from each other in the social context, all of which have constituted a whole body of university. That means disappearance of the university in the true sense of the word university. That said, though, graduates from secondary education will no longer be expected to get gainfully involved in social activities without achieving learning outcomes from higher education. It is time we prepared for the higher education in the era when there are no universities, and this talk explores its possibilities as well as argue against the naivete that would skillfully protect vested interests. Masumi Hori, General Manager, Planning Office, NPO CCC-TIES / Tezukayama Univ. In the post MOOC era, what are Moodle's prospects? With the United States sending forth the open education wave that swept across the world, 2012 came to be known as “The Year of the MOOC”. However limitations within that model were quickly identified and there is already a post MOOC movement. In MOOCs of the present, numerous problems are present: scalability of the platform, the high cost of user authentication, low completion rates including learner achievement, lack of appropriate methods for teaching tens of thousands of learners, resistance of those with vested interests and inadequate business models. Since 1996, we at the NPO CCC-TIES, have taken on educational openness in Japan, and over the last year have developed a post MOOC learning platform. CHiLOs (Creative Higher Education Learning Objects) uses Moodle as its backend becoming a portal to ebooks. Our aim is to construct a comprehensive VLE (Virtual Learning Environment) that will bear up even in very large scale courses. The concept we have adopted is the micronization of comprehensive VLEs. Through the process of developing ChiLOs we are coming to see the next generation of learning platform. 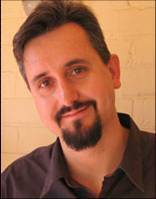 Adrian Greeve, Moodle core developer and driving force behind the recent alternate name project. Moodle is changing to fit Japan. Administrators need flexible ways to display names with multiple alphabets and characters. Students love the gaming atmosphere of learning software and social networks. Thus the new Moodle 2.6 addresses these needs with additional name fields and gamification features. The alternate name fields started as an idea from the members of the Moodle Association of Japan. As a programmer at Moodle Headquarters in Perth, Adrian Greeve took up the challenge of implementing a solution as a personal project and after further encouragement from the Moodle Association of Japan, the project was moved to official sprint status. While the initial additional name fields issue is complete, the project itself is still in the early stages of developing flexible tables and sorting features throughout Moodle. The current implementation is the basic core feature, so additional issues have been created to make alternate name fields even more useful, not only for Japan, but for the Moodle community as a whole. These new displays will be discussed and displayed in this presentation. In addition, the trend toward gamification in courses is now being added through existing and future projects in Moodle. Popular studies have divided people who play games into eight different types. Using these categories as a guide, it is important to try and create a course that encompasses the possible different ways that people will interact with your site. With the recent addition of open badges to Moodle, and the use of other new methods, Adrian will show how it is possible to create a Moodle site that can be more engaging to the student. *have your say in Moodle development. This presentation will cover how you can make the most of the support offered via the Moodle community sites and how you can be involved in determining Moodle's future. Martin will talk about recent efforts underway at Moodle HQ, including the recent release of Moodle 2.6, the current work on Moodle 2.7 and the plans for the future as Moodle gains sentience and stages a peaceful takeover of all the world's major cities, gathering resources from neighboring planets and asteroids to build a massive faster-than-light spaceship that tours the galaxy teaching aliens. A collection of English travel guides. 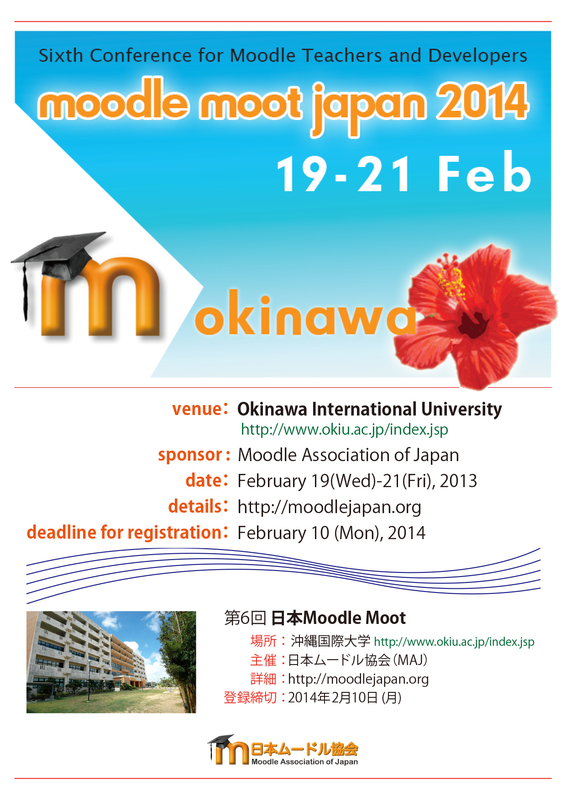 This is the process you need to follow to register to the Moot (conference) and/or become a member of the Moodle Association of Japan. 1) First, read the "Membership Categories and Fees" page below and make sure you understand the different member categories. 2) Next, please go to the following page and create your own account in this MAJ moodle site. 3) After logging in to this site with your new account, please come back to this page and click the "Moot 2014 Participant Registration and MAJ Membership" link below, then you will be connected to the ConfTool conference management system. There you can register yourself for the moot (and membership). 4) For payment, follow the directions in "Payment methods" page below. Thank you. Tentative start/end times of the moot.